I've never been one to full-out idolize celebrities, rappers, or ball players. But, regardless of my parents' teachings, the story of Reggie Lewis always hits me hard, especially considering the circumstances surrounding his death. A Baltimorean, Lewis attended Dunbar High School, a national powerhouse in the late 70s and early 80s. Afterwards, he attended Northeastern University where he scored over 2,700 points. Upon graduation, he was drafted by the Boston Celtics with the 22nd overall pick in the 1987 NBA Draft. Boston was still reeling from the tragedy from one year earlier. In the 1986 NBA Draft, the Celtics drafted a young man named Len Bias. I'll go into Bias' story more later today on SpeedontheBeat.com. Lewis' first year, he came off the bench every once and again. In the 1988-1989 season, however, Lewis saw his stats soar. This was partly because Larry Bird was injured and partly because he was actually given a chance to play. And every season between 1989 and his death, the "he's the next big thing" hype was met by results, including an NBA All-Star Game appearance in 1992. In the 1992-1993 season, Boston was clearly Lewis' team. But, during the 1992-1993 Playoffs and shortly afterwards, something drastic and tragic happened. First, Lewis collapsed during the Celtics' first-round series with the Charlotte Hornets. He returned, in typical Lewis fashion, and scored 17 points in 13 minutes. Looking back, yes, Lewis should've been taken to the hospital right after he collapsed. But, let's keep in mind that this was 1993. Footballers were still allowed to go back into games post-concussion as long as they weren't completely knocked out. It was a different time. Then, on July 27th, 1993, about seven years and a month after Len Bias' death--and about three years after a similar situation with Loyola Marymount player and legend Hank Gathers--Lewis died from sudden cardiac death and an adenovirus infection. He was 27 and just came off one of his best seasons as a pro. So...what could've been if Lewis' ailment was better monitored? As mentioned, Lewis' ailment, in the 1990s, wasn't as understood. It's kind of how cancer was looked at around the era of Brian Piccolo, from what I can gather. Not only had the technology caught up with the illnesses, but people weren't as progressive in tracking these sorts of things, family history or not. No, I'm not blaming Boston for letting him die or something. But, it was a different time. However, had Lewis' ailment(s) been properly documented, precautions could've been taken. Yeah, he could've missed a year or a couple months, but he would've had the chance to impact his team's future past 1993. Players in recent times I can think of who've had heart issues but've still been able to play in spite of them, because of the advancements in technology and understanding of these issues include Randy Foye, former Celtic and current Grizzly Jeff Green, and Chris Bosh (yes, I know what pulmonary embolisms are; that's why I'm listing him). Basketball-wise, in the 1993-1994 season, the Celtics were in a bad way. Finishing fifth in the Atlantic Division, the team's first Lewis-less year also marked the first of several consecutive losing seasons. Had Lewis not died, it's entirely in the realm to believe that the Celtics' struggles would've been alleviated. Lewis was a player who was something of an iron man and possessed great leadership skills. Plus, he could score almost at will. Additionally, can you imagine if a young Paul Pierce had an older Reggie Lewis, just like Lewis had Larry Bird, to mentor him? Granted, the Celtics probably would've had to lose year, after year, after year to gain draft rights to Paul Pierce. But, it's a fun additional thought to think about. 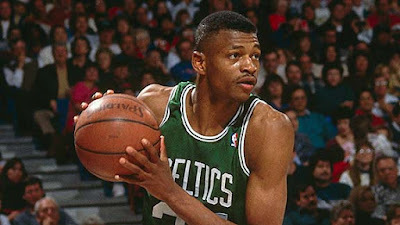 Suffice to say, had the late, great Reggie Lewis lived, the NBA would've been a different place. Lewis may've never hit "Jordan-levels" of recognition, but his greatness would've further been appreciated. Especially if we would've gotten more moments like these. R.I.P., Reggie. Hopefully, you and Len are making one heck of a DMV two-on-two team now.